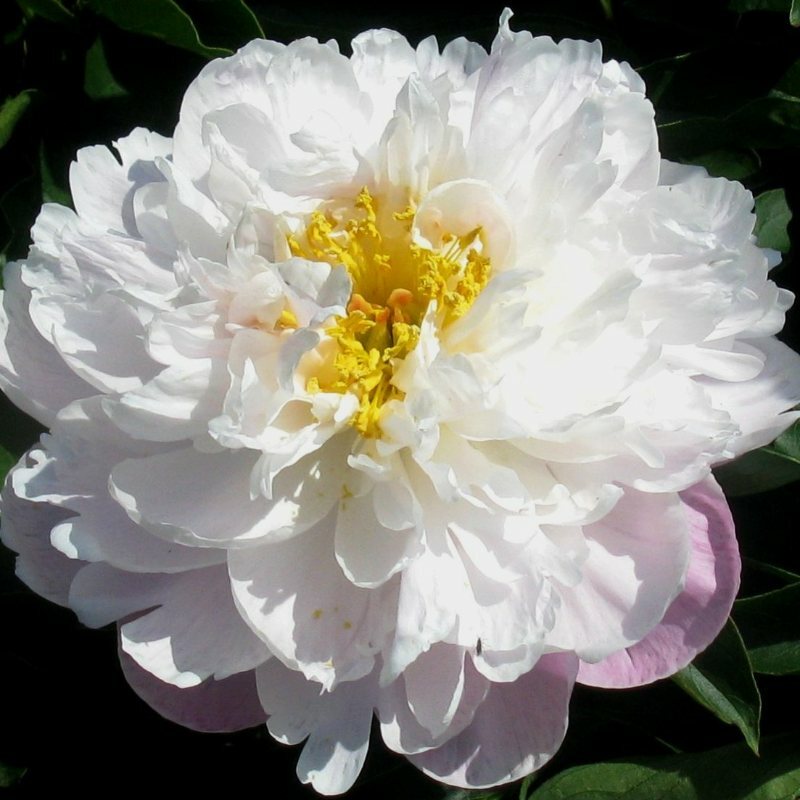 Semi-double; large, cupped outer petals and smaller inner petals are light pink to blush. Inter-mixed stamens impart a creamy glow. Sweetly fragrant flowers are set close to the broad bush on stout, very erect stems. Bush of semi-dwarf to medium height. Shoots emerge red-purple; medium large leaflets mature to dark green and develop fall color. Species cultivar, P. lactiflora.�Parentage: 'Nippon Gold' x 'Cytherea'. Fertile, stamens, pollen and seeds. Semi-double lactiflora of hybrid origin. Parentage 'Nippon Gold' x 'Cytherea'. First bloomed 1984. Mid-late bloom. Light pink to blush, with light yellow stamens, a semi-double cup shaped form, reliable with good substance. Pollen and seeds, sweet fragrance. Strong stems, holds flower erect 28-33 inches, vigorous. Sandra Marie is a lactiflora type of hybrid origin. Emerging shoots, red purple, medium large leaflets, mature dark green and develop fall color at season's end. Seedling № 1865.